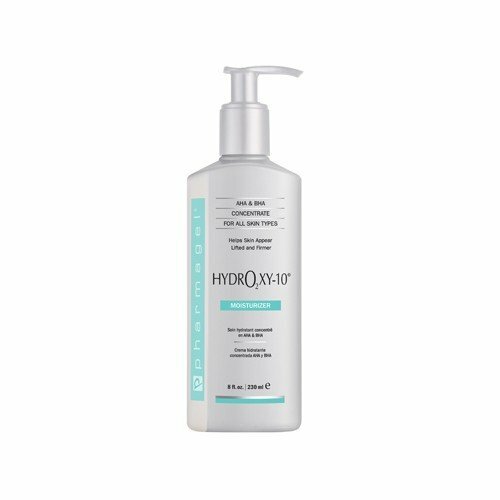 HydrO2xy-10 is a moisturizing lotion concentrate for the face and body that helps skin appear lifted and firmed. It contains both Glycolic Acid (AHA) and Salicylic Acid (BHA). BHA works as an exfoliator to help skin look rejuvenated. Glycolic Acid offers gentle, natural exfoliation. HydrO2xy-10 also contains stabilized oxygen for rapid absorption to help skin appear revitalized, firmed, and rejuvenated. The appearance of wrinkles and fine lines is diminished. HOW TO USE: Apply to face and body morning and evening. Also a great product to reduce the appearance of unsightly chicken skin" bumps on the upper arms. ""OW TO USE: Apply to face and body morni"